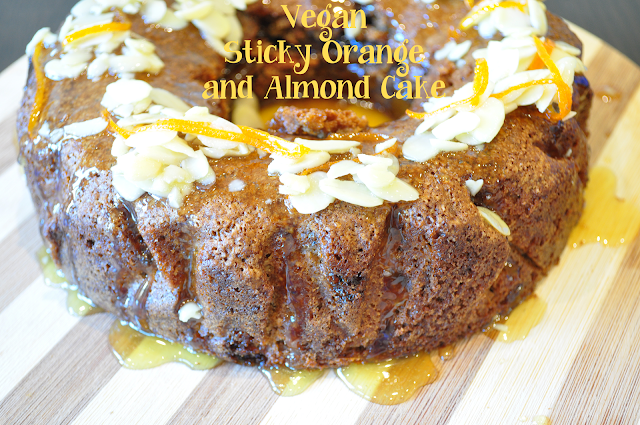 Vegan Sticky Orange Cake w/ Orange Drizzle! So, first of all, I'm not vegan.I have to get this off my chest, because I hate the stigma associated with vegan food. You tell someone that you've made something vegan and they automatically frown and think “Ew gross you're feeding us wheatgrass and chia seeds!” I don't understand this stigma. In fact I don't understand why there's such a dependence on meat and animal products in general. If I really think about eating animal biproducts I can really make myself sick. This is why I don't. I tend to eat higher welfare meat when I do eat it, and I am generally careful about where I source ingredients. It's in your best interests to keep watch over things that go into your body instead of becoming completely complacent about things!! Ok rant over, now that we're past my little rant, I want to talk about my orange cake. I have had in my mind for a while now that I wanted an orange cake of some kind. I know the fundamentals of a plain sponge and I can make one quite easy, but I really wanted to use some ground almonds and...I wanted to keep it healthy, and maybe vegan. So I did a little research on how to lighten things up and how to substitute eggs in a cake. Apparently it's really easy to do as I've found out. While the cake isn't exactly what I was going for in my mind, it definitely turned out to be a great treat and I will definitely try to use the base of the recipe as a blank canvas to try many other confections. The best part about this cake is there's nothing weird and wonky in it to get it moving or to get it the right texture or whatever. *Disclaimer: Ok, so here's the thing, baking is somewhat of an experimental thing for me, and this cake was no different. I originally took the cake out of the oven too soon even though the toothpick came out clean. It had risen really high so I took it out and shot lots of photos. I came back a few minutes later and it completely fell in the centre bc it wasn't done! OOPS. I put it back in the oven and cooked it but I couldn't save the soggy middle...so I decided to cut it out with a ring mould and make it a bundt cake ut I'm sure it will be fine next time. I just was careless!! Next measure out all of the ingredients so you're ready to mix. First mix together flour, ground almonds baking soda, salt. 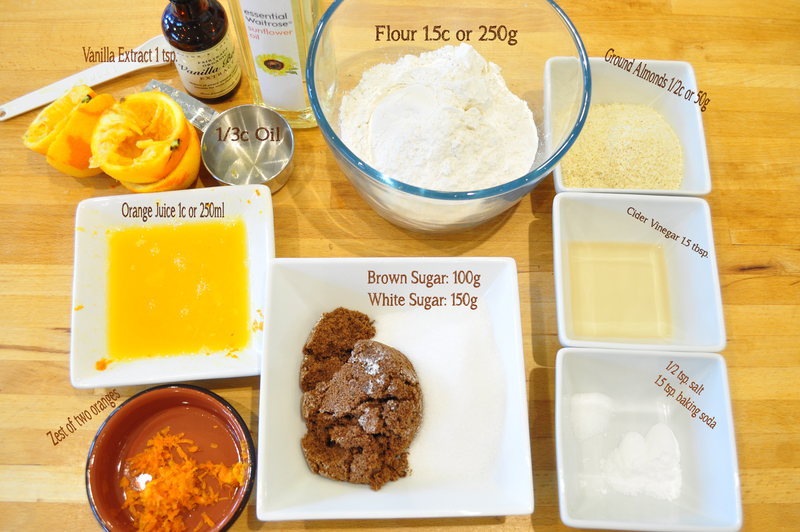 In a larger bowl, mix together oil, orange juice, orange zest, sugars, vanilla, and cider vinegar. Mix thoroughly and quickly add in the dry ingredients and mix to combine. Pour into your prepared pans as soon as possible and get it into the oven. Depending on your oven, check at 45 minutes and remember my disclaimer – it will look risen enough. Be absolutely sure before you pull it out. Sift icing sugar into a small pan. Add the orange juice and wisk heavily to remove any lumps. Bring to a boil and boil down to a thick syrup. 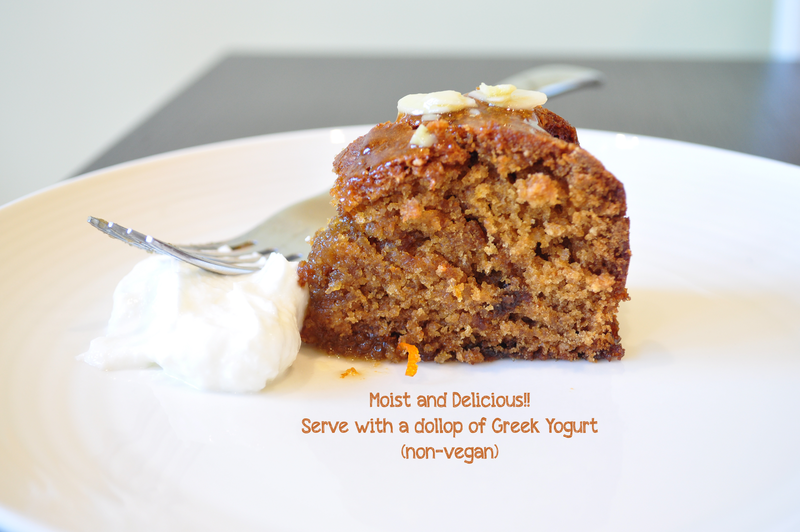 Add almonds and optional orange zest and drizzle on your cake. Good with orange, lemon, teriyaki sauces! First of all if you're reading this hello! Welcome back me. It's been a while. I've been trying to do some work on images and setting up a new layout for my blog. It hasn't all transpired yet so I will just take some time to write a few things and post them as I go! Ah, what at hought. Anyway's, this is some crispy tofu. I have never really liked tofu only dishes. 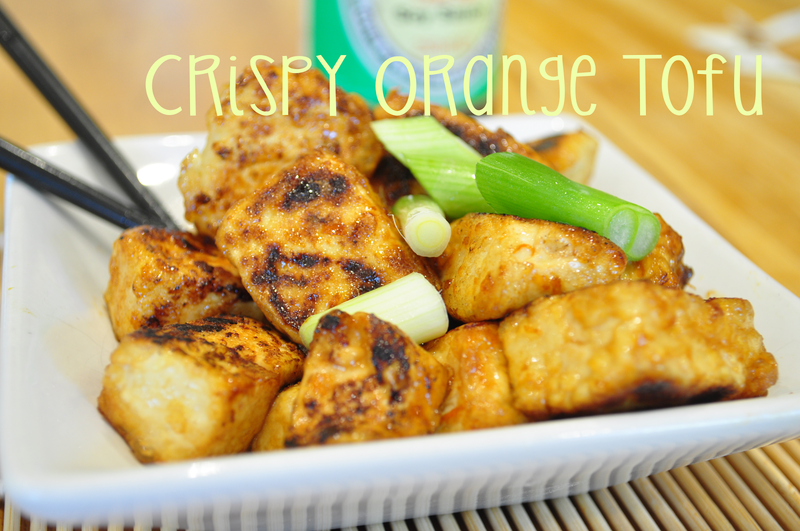 I've always seen that really crispy tofu and wondered, “How the heck do they get it so crispy?” I never really tried to find out but I had some tofu laying around and a few ingredients and decided to whip something up. Of course this recipe is simply really just for the crispy tofu. You can change anything in the recipe to suit your own tastes, anything that you might want to replce chicken with tofu. Lemon tofu? Sesame tofu? Teriyaki tofu? The list goes on and on. Of course those were just asian suggestions bc it goes so well with those flavours! Ok get on this folks. This is a simple recipe just for one person, as I didn't make a whole meal from it but use the method to suit your needs. First we want to drain the tofu by placing it in between two plates and weight it down for about 30 minutes. 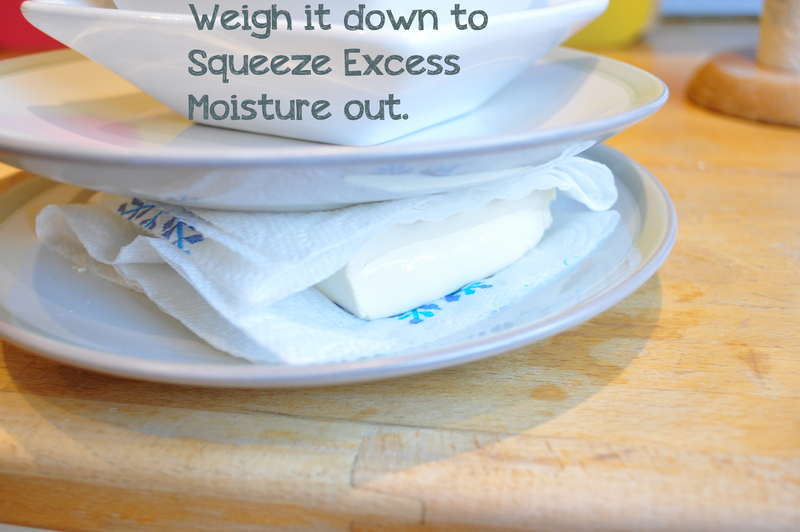 Keep replacing the kitchen roll to remove excess moisture. While the tofu is draining, bring the orange juice, brown sugar, soy sauce, rice vinegar and sesame oil up to a gentle boil in a suacepan. Check and stir constantly to prevent burning. Leave to simmer until it's a thick syrupy sauce. Cut the tofu in big cubes and dredge in cornflour. Heat up the oil and fry fry fry. Make sure not to touch until it moves away from the pan with ease otherwise it will make a mess. When crispy, pour in the sauce and toss to perfection.